Producing an image from data from an array of radio telescopes required much new mathematical work. Four independent teams created images to assess the reliability of the results. These methods included both an established algorithm in radio astronomy for image reconstruction known as CLEAN, invented by Jan Högbom, as well as self-calibrating image processing methods for astronomy such as the CHIRP algorithm created by Katherine Bouman and others. The algorithms that were ultimately used were a regularized maximum likelihood (RML) algorithm and the CLEAN algorithm. Overbye, Dennis (June 8, 2015). "Black Hole Hunters". NASA. Retrieved June 8, 2015. Overbye, Dennis; Corum, Jonathan; Drakeford, Jason (June 8, 2015). "Video: Peering Into a Black Hole". The New York Times. ISSN 0362-4331. Retrieved June 9, 2015. ^ Pallab, Ghosh (April 10, 2019). "First ever black hole image released". BBC News. Retrieved April 12, 2019. ^ "Black Hole Cam". blackholecam.org. Retrieved April 12, 2019. 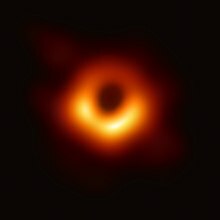 ^ "EU-funded scientists unveil first ever image of a black hole". erc.europa.eu. Retrieved April 12, 2019. ^ a b "Even Horizon Telescope Organization". eventhorizontelescope.org. Retrieved April 13, 2019. Shep Doeleman, on behalf of the EHT Collaboration (April 2019). "Focus on the First Event Horizon Telescope Results". The Astrophysical Journal Letters. Retrieved April 10, 2019. Overbye, Dennis (April 10, 2019). "Black Hole Picture Revealed for the First Time". The New York Times. ISSN 0362-4331. Retrieved April 10, 2019. This page was last edited on 20 April 2019, at 15:38 (UTC).